Today's automobiles are highly advanced in terms of the technology they use to run and operate in a safe and efficient manner. Yet, they can't do everything, such as tell you about every problem that the car is suffering from. 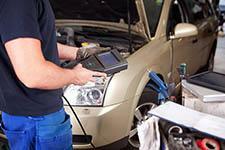 By paying attention to the way your car runs and drives, you can detect issues as the begin. As long as you get into an auto repair shop before too long, the problem shouldn't grow worse. The following are a few of the most telltale signs of car trouble. There are many different issues that create odd noises as you cruise down the road. One of the most common car troubles diagnosed by sound is low brake pads. If your car creates a grinding or squealing noise as you slow down, be sure to visit your local auto repair shop. Weird noises should not be ignored, so head to a shop for diagnostics anytime you hear something strange. A shaking and vibrating car is certainly a sign of trouble. If you encounter a vibrating gas pedal it could indicate an exhaust leak, where as a shaky steering wheel is almost certainly a sign of poor wheel alignment. Did you catch a whiff of something while driving your car? Some of the more common smells of car trouble include a maple syrup odor, which often indicates a coolant leak, a dirty laundry smell, which is usually a sign of mold growth in the heater or AC vents, or a burning paper smell, which in a manual transmission vehicle can mean it's time for a new clutch. Your car uses a number of specialized fluids to operate its various systems. If you notice something dripping from your car be sure to visit your local auto shop right away. The most common leaks include a coolant leak, brake fluid leak, transmission fluid leak, differential fluid leak, power steering fluid leak and of course an engine oil leak. As mentioned, cars are pretty smart. They can detect many issues that you can't with your senses. If the car's sensors pick up a sign of trouble, it'll illuminate a dashboard indicator light, such as the check engine light, ABS light or oil light. Diagnostics need to be ran ASAP to pinpoint and fix the trouble. If you have experienced any of the above don't hesitate to contact a local auto shop to schedule diagnostics and repair. For professional auto repair in Birmingham head to HESCO Automotive. Our team of auto repair professionals will have you on your way in no time, regardless of the trouble you're experiencing. Give us a call at (205) 526-3796 to request more information or to schedule superior auto repair in Birmingham, AL, today.